It’s estimated that the average person in North America will spend six months stuck in traffic over their lifetime. So it’s not hard to imagine how the stressors of the road: car exhaust, road rage, and honking horns can contribute to poor health in the long run. Following an initial literature study, Florian and his professor worked with residents of Flemingdon Park, a neighbourhood in Toronto’s North York district, to envision a new design that would emphasize public health. Such a design could include more green spaces and parks, improved traffic flow, and spaces for social integration and cultural connection. Their collaborative approach to developing the design also helps the community to define their own needs and determine what public health looks like to them. 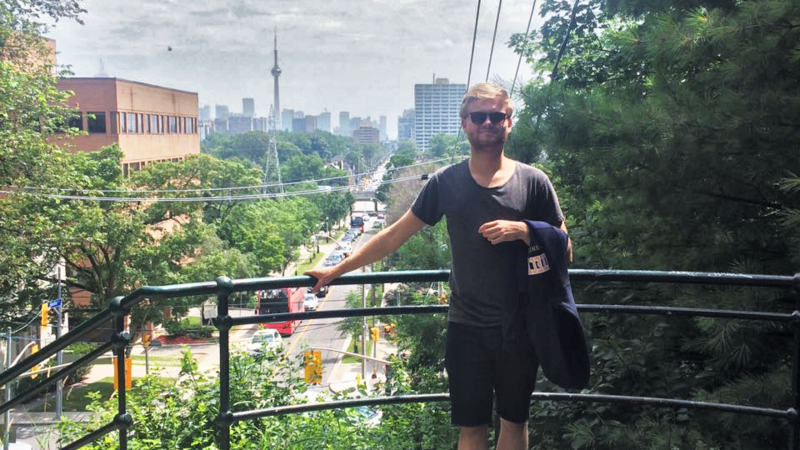 For his part, Florian enjoyed a summer of learning, saying, “Ryerson’s Department of Architectural Science, where I was working, is a very good research facility. The students and researchers are very ambitious and the quality of work they create is astonishing. Mitacs thanks the Government of Canada and the Government of Ontario for their support of the Globalink research internship in this story. Across Canada, the Globalink research internship program also receives support from Alberta Innovates, the Government of British Columbia, the Government of New Brunswick, the Government of Newfoundland and Labrador, the Government of Nova Scotia, the Government of Prince Edward Island, the Government of Quebec, the Government of Saskachewan and Research Manitoba.